E-commerce giant eBay (EBAY) is taking window shopping to the next level -- by letting you buy stuff online from the window itself. 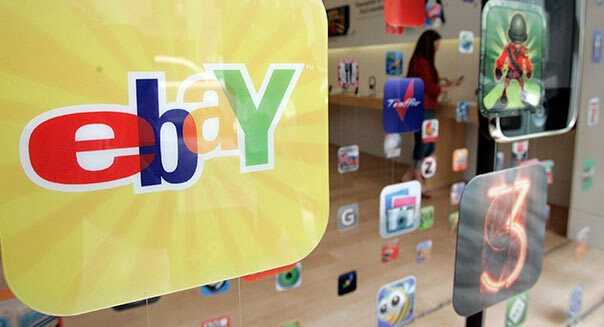 Reuters reports that eBay has started installing giant touch screens on the storefronts of vacant retail properties. Passers-by will be able to browse items from retailer Fifth & Pacific and then make a purchase directly from the screen. The goods can then be delivered within an hour, and you'll be able to pay the courier with PayPal. The first four screens will be in New York City, and will sell a limited number of items from Fifth & Pacific's (FNP) Kate Spade Saturday collection. New Yorkers will be able to find the screens in neighborhoods including SoHo and the Lower East Side from June 7 to July 8. For Fifth & Pacific (which until about a year ago was called Liz Claiborne), it's a great way to establish a physical presence for a new brand without making a big real estate investment or signing a lengthy lease for a storefront. It's also good news for neighborhoods -- vacant storefronts can now be transformed from eyesores into something attractive and functional during times when landlords are having trouble finding retail tenants. Whether consumers will use the service is another question. Online shopping has always involved a tradeoff between convenience and experience -- you can't try on the clothes or test out the electronics, but you can at least make the purchases from the convenience of your couch. Putting the online retail experience into a store window is a cool way of bridging the gap between online and offline, but it also means you get none of the in-store experience and none of the shop-at-home convenience. A shopper who is already out and about in a retail-heavy neighborhood may be less inclined to buy from a giant screen if she can easily walk into a store and try on the clothes she's considering. When it comes to your safety, you should never shop secondhand. Minor scratches or dings in helmets that you might be unable to spot right away can cause their safety rating to fall. Buying tip: According to Bicycling Magazine, some of the best bike helmets include the Giro Atmos, Louis Garneau Quartz and Bontrager Oracle. Cribs can stand a lot of abuse from cranky toddlers, but you want to make sure your children aren't put in danger by a potentially damaged bed. According to The New York Times, issues with unsafe cribs led to 150 deaths between 2007 and 2010. Buying tip: Squidoo recently put together a list of the top ten baby cribs for 2013. Any small defect in a secondhand laptop will only get exacerbated over time. You also don't have the luxury of a warranty or customer service guarantee if you don't buy it new yourself. Buying tip: If you are looking to buy something on the cheaper side, most retailers offer refurbished products that are still covered by warranties. And major electronics stores like Best Buy offer steep discounts on display models. Call around to ask beforehand. Many websites advise against buying shoes used because they've probably already been formed to the foot of the person who wore them before you. Especially with running shoes, this could lead to discomfort or injuries. Buying tip: Duke Health recommends taking a good look at the sole and arch of your next pair of athletic shoes to make sure you get the best fit. Non-stick cookware especially is something you want to invest in on your own. The coatings break down over time, making them more difficult to clean and potentially releasing harmful chemicals. Buying tip: No matter what brand you buy, take extra care of your non-stick cookware to make sure it lasts. But be prepared to replace them every three to four years, on average. Hats can be difficult to clean, and that means the previous owner's lice and hair could still be lurking inside. Purchase your next baseball cap somewhere other than a garage sale. Buying tip: As with any product, Amazon has a list of the best-selling caps and hats. Blenders require their blades to be super sharp to be functioning at their best. If you buy one secondhand, it might take longer for the duller parts to puree the berries and bananas going into your smoothie. Buying tip: Good Housekeeping touts blender brands like these as some of the best. Bed bug risk aside, odors in upholstered furniture can be difficult to get out, no matter how much Febreze you use. If you buy furniture used, it might be best to reupholster it yourself. Buying tip: If you do buy used upholstery, make sure you hire an expert to do the cleaning. It's likely it will be worth the money. A tiny scratch on a used lens could wreck your next photo shoot. Lenses are a big investment, so it's probably wise to spend the money to ensure you're buying a quality product. Buying tip: Salon has a list of the best camera lenses for your buck. Never buy these - or bedding or pillowcases - secondhand. It's not worth it when you consider the risk of bedbugs and other molds or critters that could be lurking inside. Buying tip: Spine-Health.com recommends buying a mattress that has at least a 10-year warranty. And be sure to give it a test nap in the store for at least 10 minutes before buying. Besides the hygiene issues that come with a secondhand swimsuit, these garments tend to wear out very quickly. Your bikini won't do a good job covering you up if it starts to get saggy the first time it's hit by a wave. Buying tip: If you're looking to invest in a bathing suit that won't go out of style in one season, look at style guides like these to help you make a wise purchase. Wet suits need to fit well and they often wear out over time, making them less likely to keep you warm underwater. The suits aren't cheap, but don't risk getting chilly on your next scuba trip with a used one. Buying tip: SportDiver.com has a list of 36 good wetsuit brands to help you find one that's best for your next aquatic adventure. Vacuums are one of the most-used appliances and they don't last forever. If you need something that still has the suction power to clean the dust around your whole house, it might be best to buy a new one yourself. Buying tip: If you do want to save money by buying used, make sure you test it beforehand and follow these other tips, too. Safety is a major player here, too. In the event of a crash, you don't want a potentially damaged car seat to put your child in danger. Buying tip: Consumer Reports has a great list of highly-rated car seats, depending on what style you're looking to buy. Buying tires used is never a good idea, since the tread could be worn and it may put your safety in danger. Tires wear out as they age, and it's best to buy them straight from the store. Buying tip: Popular Mechanics has a helpful article about what to look for the next time you're hunting for new tires. Software usually only has codes to be used on a limited number of computers, and there's a chance you could get ripped off if you buy a used copy. It's best to buy straight from the manufacturer to make sure you get a working version. Buying tip: If you're buying a piece of software for your whole family, you can often find a software subscription with enough codes to load it on everyone's laptop. This also applies to video cameras. Since you'll be using this to capture important life moments, you want to make sure you're not getting a faulty product. Buying tip: February is usually a good time to buy a new camera, since they often go on sale before new models come out around President's Day.